The upcoming five-day stretch from Oct. 17 to 21 is known as UEA Weekend, Fall Break, Deer Hunt or Deer Widows Weekend. But it really should be called Zion’s Exodus to Anaheim, as many Utahns feel the urge to flee south to Disneyland Resort. You’re more likely to run into friends from the Wasatch Front in line at the Matterhorn than shopping at City Creek. You can’t walk through a section of the park without seeing a flood of red block “U” or Cougar blue T-shirts. It feels like Utah’s own southern California party. Although Disney won’t officially discuss marketing and plans for the annual avalanche of Utahns, ask just about any park employee and they’ll tell you that they plan for UEA. Here’s how you can plan for a Disney adventure as well. Anybody who reads, watches TV or listens to the radio will know about this summer’s debut of Cars Land in the Disney California Adventure Park. Even on a recent fall weekend, lines for the Radiator Springs Racers ride were 3 1/2 hours, and FastPass tickets were gone by mid-morning. It’s still going to be the No. 1 thing people want to do, so get to California Adventure early and get on the ride, or grab a FastPass first thing. If you don’t want to wait for a long time, or FastPass tickets are gone, consider using the “single rider” line, which gets you onto the ride in a relatively short time if you’re willing to sit wherever there’s a spot available. 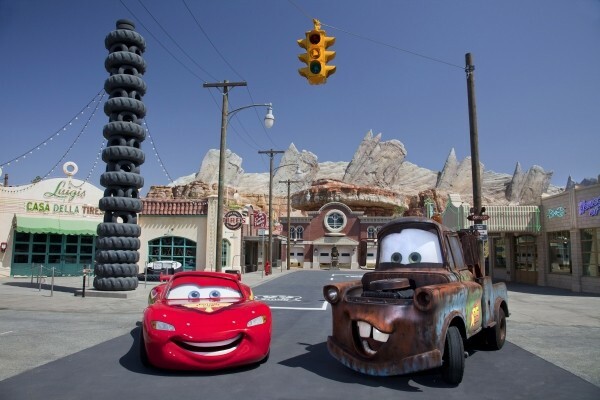 Besides Radiator Springs, Cars Land also has Mater’s Junkyard Jamboree (a children’s ride) and Luigi’s Flying Tires, which is sort of like riding on a giant Italian air hockey game. At night, Cars Land is lit up in a striking way. You can even stand out as you walk through wearing a pair of Glow With the Show Mickey Mouse ears coordinated to light up in different colors as you pass various points, including the colors of the Italian flag when you pass by Luigi’s, or flashing to the dance beats at the Mad T Party. The ears are also set up to light up at different coordinated times during the World of Color nighttime light and water show. The show is very popular, so after hitting Radiator Springs, make the FastPass boxes near Grizzly River Run your second stop to pick up show tickets. Cars Land comprises 12 acres and is “part of a complete makeover that’s been taking place at [California Adventure] over the last five years,” says John McClintock of Disney. “If you haven’t been to California Adventure in two or three years, you won’t recognize the place.” Besides Cars Land, the new entryway, Buena Vista Street, is designed to look the way Los Angeles would have looked to Walt Disney when he arrived there in the 1920s. Across the way at Disneyland, what’s old is new again, as the Matterhorn is coming off a multimillion-dollar renovation that includes cars with newly designed seats. Mountain climbers can again be seen on Orange County’s tallest “mountain” for the first time in years. The popular Star Tours ride was redesigned in 2011, and now has a series of fresh 3-D adventures featuring new destinations, characters and multiple endings. At this point in October, Disneyland will also be in full Halloween mode. The Haunted Mansion features creatures from Tim Burton’s The Nightmare Before Christmas; on Friday, Oct. 19, the park will host Mickey’s Halloween Party until midnight. The party starts at 7 p.m. and features trick-or-treating, parties and specially costumed characters. To find deals on tickets, accommodations and packages, check the Disneyland website (Disneyland.Disney.go.com) or try MouseSavers.com. Southern California CityPass (CityPass.com/southern-california) also offers a ticket package that includes a three-day Disney Park-Hopper as well as admission to SeaWorld and Universal Studios Hollywood. Once in the parks, your best bet in the digital age for getting the most out of your day is an app on your smartphone. There are a number of apps focused on Disneyland Resort. Walkee, for $3.99, has wait times, daily park calendars, restaurant locations and menus, panoramic GPS maps of the parks, and gives you the ability to create daily itineraries and checklists. RideMax (RideMax.com) offers subscription plans starting from $14.95 depending on what park you’re visiting and how long you want your subscription to be. It can also be used on a computer in advance of visiting the park to create a detailed daily itinerary based on which attractions you want to visit, FastPass options, when you want to start and end your day, and how quickly you want to move through the park. MouseWait is free, has up-to-the- minute wait times, FastPass availability and return times, show availability, food lines and hotel-booking options. And Disney’s own official Disney Mobile Magic is free, offers wait times and FastPass availability and return times, park maps and schedules for attractions, shows and character greetings. Park hours: 9 a.m.-8 p.m.
Mickey’s Soundsational Parade: 6 p.m.
Pixar Play Parade: 4 p.m.
World of Color: 8:15 p.m.
Mickey’s Soundsational Parade: 7 p.m.
Park hours: 8 a.m.-7 p.m.
Mickey’s Soundsational Parade: 3 p.m., 5:30 p.m.
World of Color: 9 p.m., 10:15 p.m.
Mickey’s Soundsational Parade: 4 p.m., 6:30 p.m.
Park hours: 8 a.m. to 11 p.m.
Pixar Play Parade: 5 p.m. Fantasmic! : 9 p.m., 10:30 p.m.
Park hours: 8 a.m.-10 p.m.
Kathleen Curry and Geoff Griffin write and blog about their treks near and far for City Weekly and host the weekly Travel Brigade Radio Show. You can follow them on Twitter @TravelBrigade.